Ages and ages ago (probably, almost literally, years ago) a friend told me that her son was an enthusiastic eater of zucchini and haloumi fritters. At the time I thought “oh, that sounds nice, I must make those” and then never got around to it. We typically don’t eat a huge number of zucchini (I tend to call them courgettes): I love them but Andy is somewhat ho-hum about them. So when it comes to shopping, they always run a very poor second to broccoli (universally loved in our household). However, recently we’ve had something of a glut of zucchini forced upon us. Mum grew them (in the right conditions they grow like weeds) and there were also a few in my Keane’s vege box. 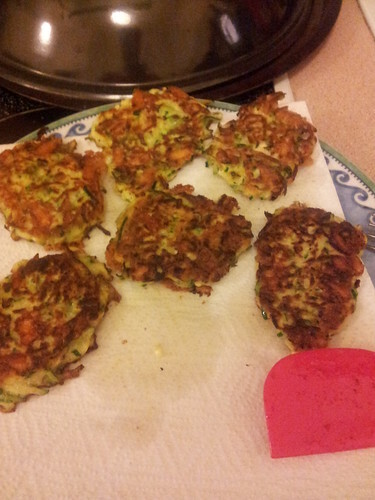 So the time was well and truly nigh for breaking into zucchini fritter territory. I had a quick google and cobbled together my own recipe based on what seemed to be very standard kind of territory. These were very quick to make – although you do need to allow a little time for grating and salting the zucchini. Herb-wise you can mess around – I used mint, but dill would definitely work just as well, and some recipes use just parsley. My advice would definitely be to use FRESH herbs rather than dried. And if you happen to have a lemon hanging around, grate the rind of half of it into your mixture. As always, be generous with your seasoning. It is best to fry one off and adjust the seasoning before committing yourself to the whole batch! Serve the fritters hot, with salads. Andy and I loved these. And while these are perfect toddler food, our toddler was not bothered either way. And if you don’t want to print, download a pdf of the recipe! Coarsely grate the zucchini and, in a large bowl, mix through a generous pinch of salt. Set aside at room temperature for approximately half an hour. Squeeze the moisture out of the zucchini - by hand is fine - and place it in a clean,dry bowl. Stir through the spring onions, feta and mint and then add the eggs one at a time. Mix through the verjuice and then stir in the flour, one tablespoon at a time. You may not need all the flour - you want to bring the mixture together but you don't want the mixture to become dry. The more flour you use the greater the risk you'll taste raw flour in the finished product. You're much better off to have a slightly too loose mixture - you can always add more flour once you've fried your test fritter! Heat some olive oil in a non stick pan. Add the fritter mix to the hot pan by the tablespoon, taking a moment to spread each fritter out a little. In my 20cm pan, I was able to cook about 4 fritters at a time. Flip the fritters when the base in browned. They're easy to flip when they're ready. If the fritters have been spread out, they'll be ready when brown on both sides. I made these with fresh dill, despite mint being the traditional pairing for zucchini, and they were lovely. I added one clove of crushed garlic, which helped them along, however, I neglected to put in grated lemon rind which would have finished them off to perfection!